Overwhelming majority of visitors to Taormina are charmed by the beauty of this city so amazingly combining the best of all – location, ancient Greek and Roman past, strong medieval traces as well as present days narrow streets, cafes, restaurants, little shops and fairy-tale-like gardens. 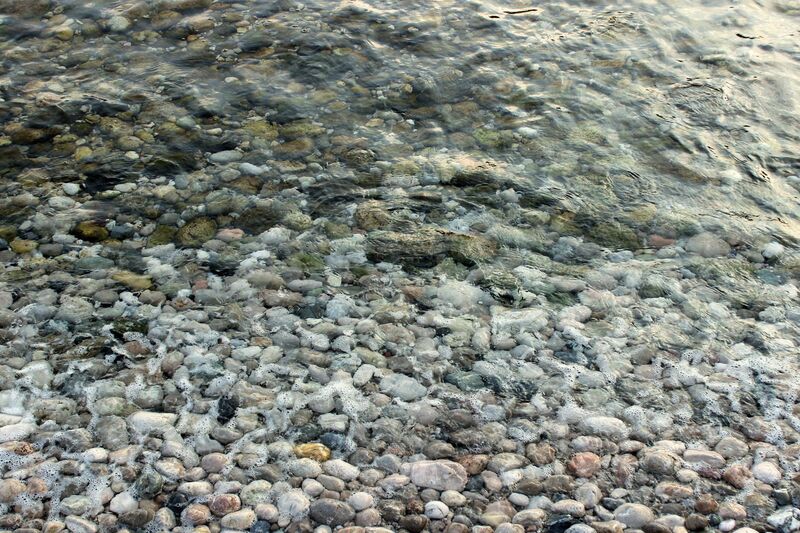 But Taormina is not an oasis in the proverbial “Middle of nowhere”. Just the opposite – the nearby coastline where the hilly land meets blue waters of the Ionian Sea is a “not to miss” paradise on its own. One of the most charming coastal spots is the Isola Bella. 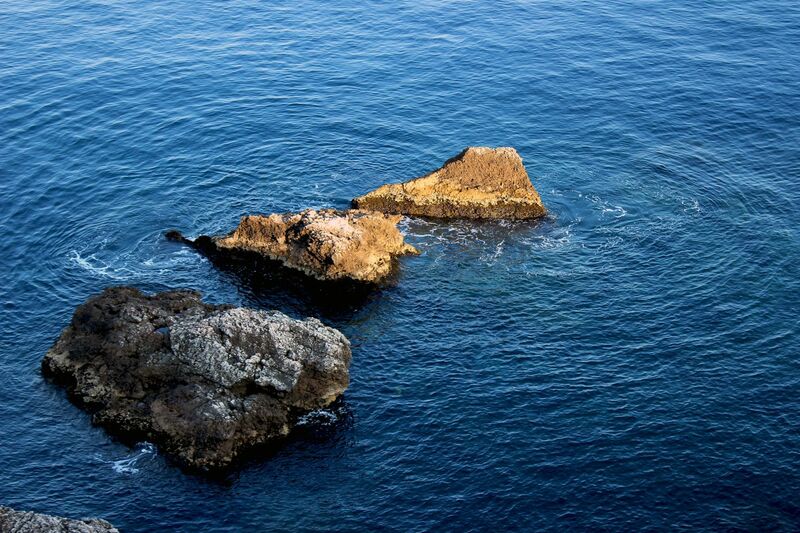 Located in the middle of the little bay protected by two promontories – St. Andrea and Capo San Leo (now Capo Taormina) the island is connected to the mainland by a narrow strip of sand. 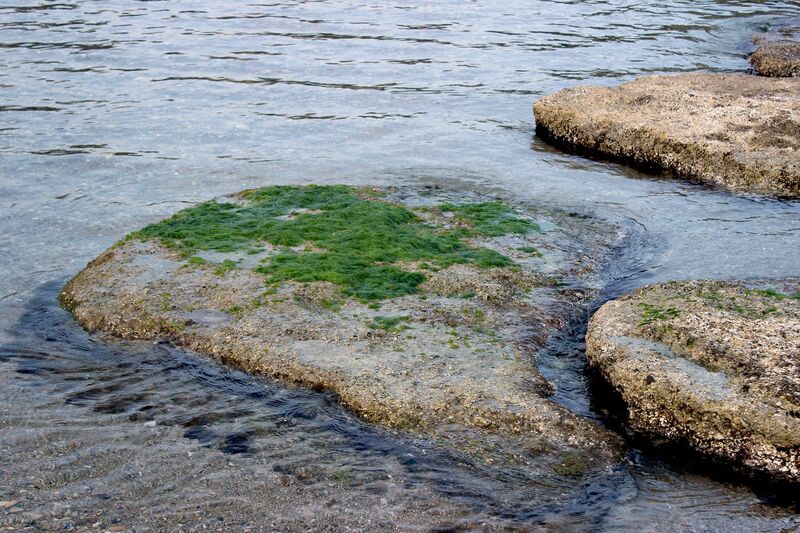 While depending on weather and tides the path can sometimes disappear under a tiny layer of water, the island is easily accessible by foot. 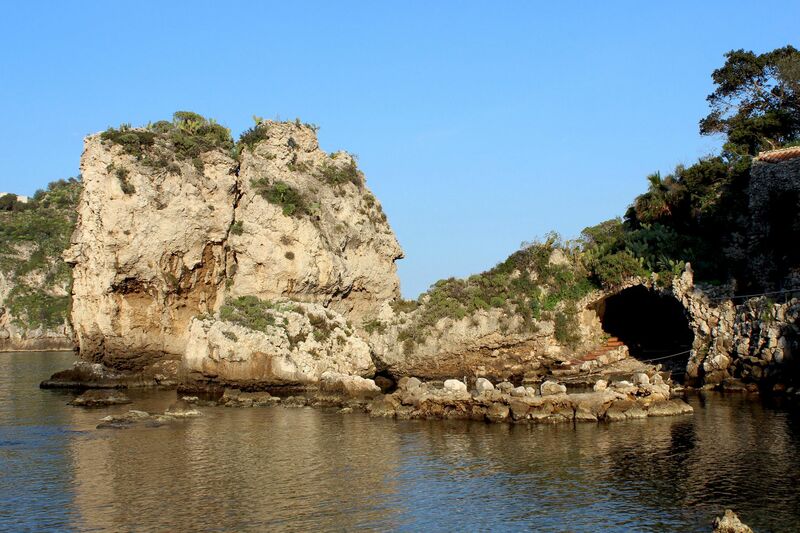 Actually, due to this “umbilical cord” connection to the Lido Mazzaro beach some consider the Isola Bella to be an outcrop (offshoot) rather than the island. 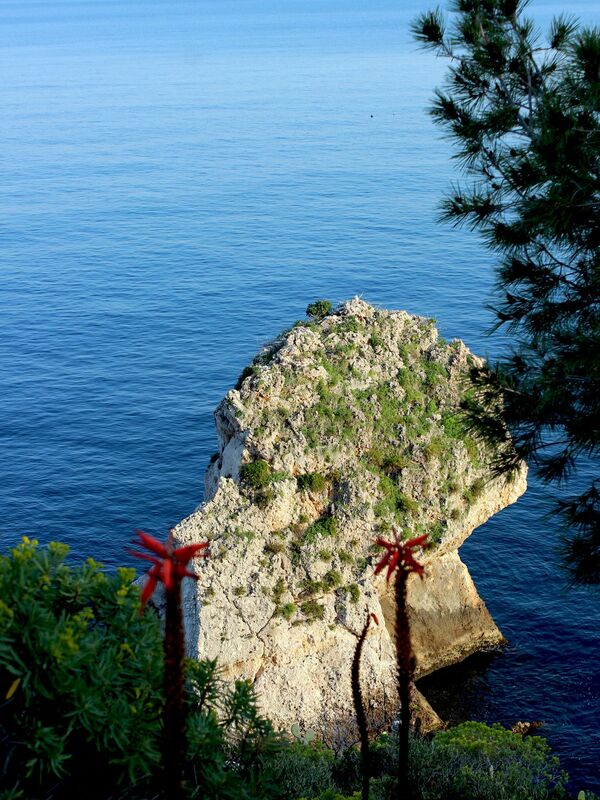 Island’s fantastic landscape and charming surroundings earned it the “label” of The Pearl of the Ionian Sea. 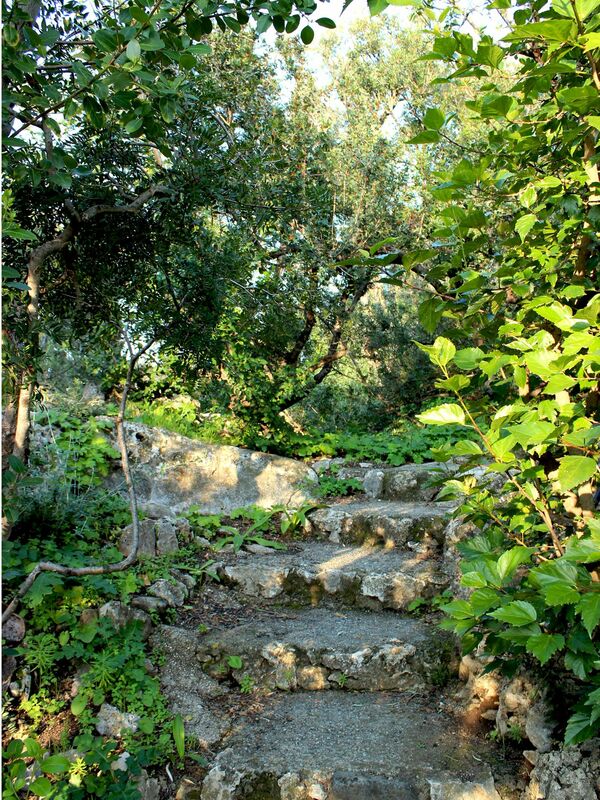 In the past the island was called Santo Stefano – a testimony to long Byzantine presence. 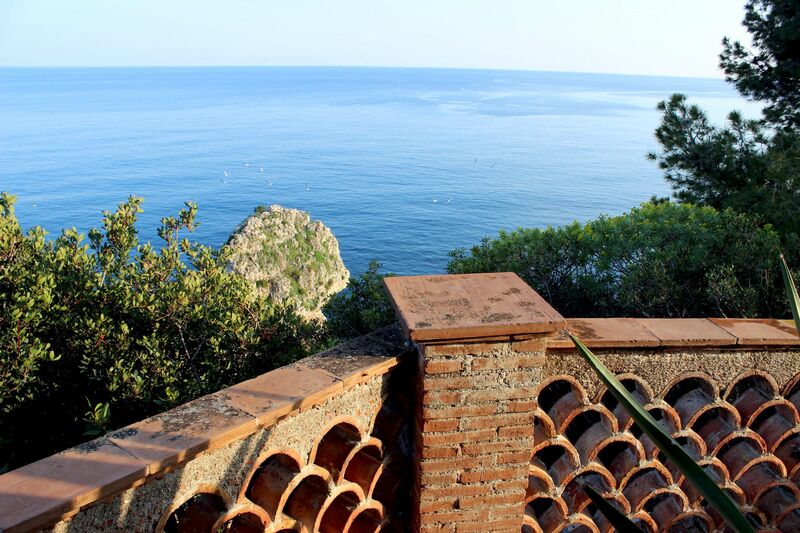 Its current name Isola Bella reflects the natural beauty and is attributed to the famous German photographer Wilhelm Von Gloeden who major part of his life spent in Sicily. From the commercial point of view the island did not represent any particular value, so not surprisingly, for long it was a forgotten place. 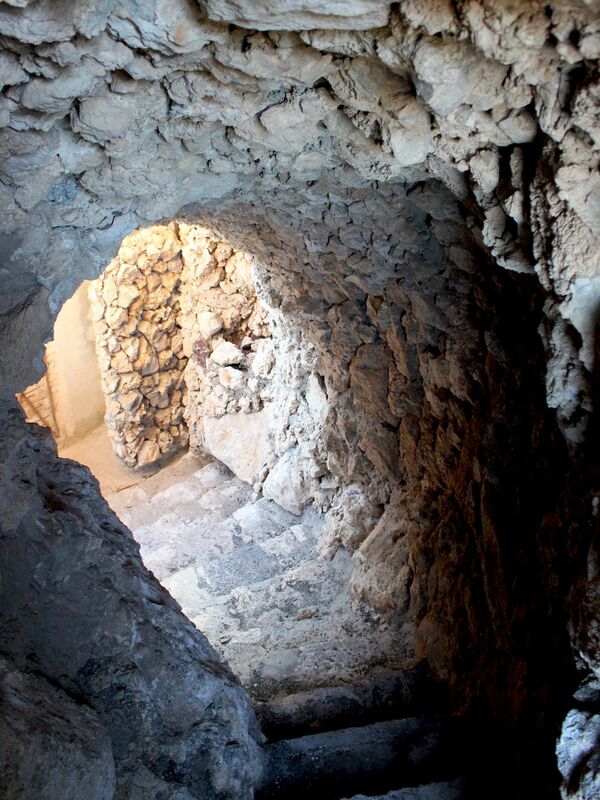 The first known written reference came in 1806, when the King of Sicily – Ferdinand I Bourbon with a typical “royal generosity” donated what did not belong to him (Isola Bella) to the city of Taormina. But 19th century brought new trends in lives of noble, rich families searching for “exotic” (as we will call today - artistically inspiring, romantic, scenic...) places. In fact the Isola Bella as well as the little bay is certainly a charming corner that offered a lot of inspirations not only to those that “have”, but also to such illustrious poets like Goethe or Byron…. 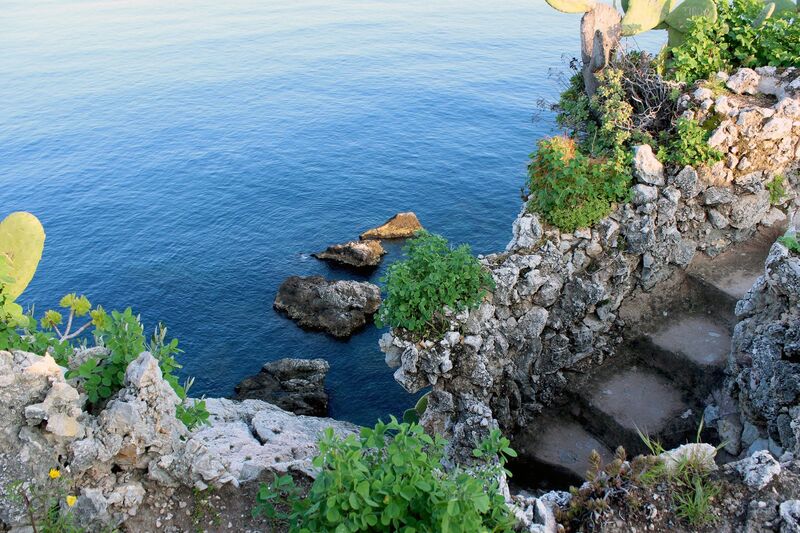 In 1890, the island was purchased from the town of Taormina by Lady Florence Trevelyan. This English noblewomen and relative to “British Crown” was exiled from the motherland due to “forbidden” relationship with the future British King Eduard (Queen’s Victoria son). In Taormina she married the influential and wealthy man then city’s mayor - Salvatore Cacciola. I’m pretty sure that despite this “excitingly” romantic story, to most of us she is still an “obscure” personage we never heard about before. 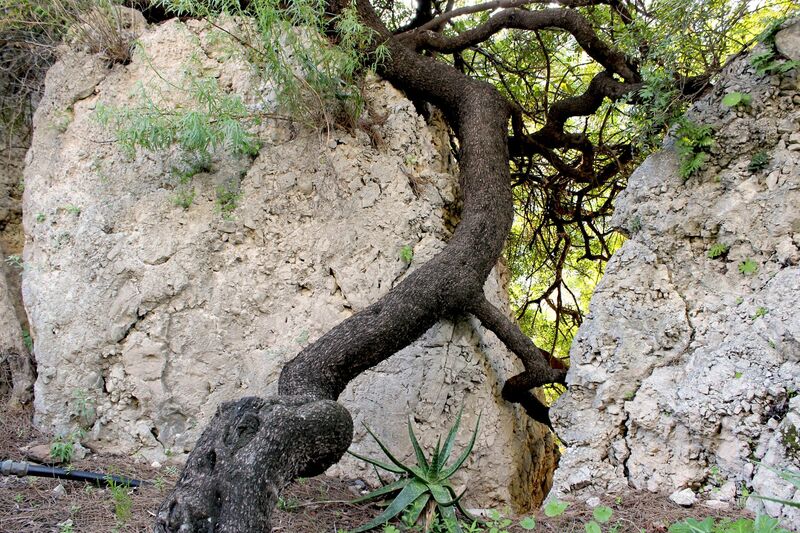 Visitors to Taormina’s Public Gardens may get however good idea as of who was Lady Trevelyan. 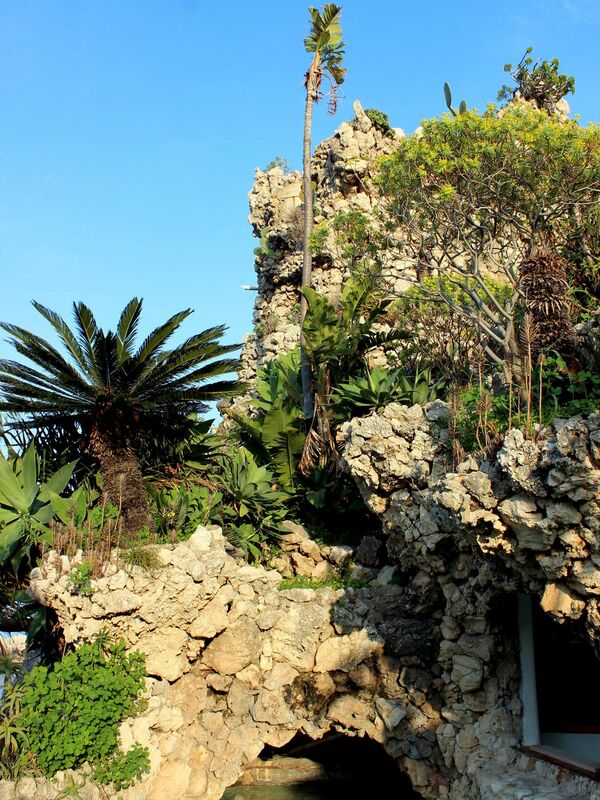 The hanging at the edge of Monte Tauro garden was founded and designed in details by Florence Trevelyan – seemingly in an attempt to bring to Sicily a little piece of England. And truly, it’s a fabulous place combining breathtaking location, amazing nature with many rare and exotic species of flora and fantastic wooden structures from the world of fairy-tale. Old house with entrance from the sea which also served as a "boat-house"
No wonder that the Isola Bella was quickly converted into a small private “paradise garden” with the little cottage sitting atop. Surrounded by greenery helping to blend it into island's rocky landscape, the cottage still exists today. After the death of Lady Trevelyan, the property stayed in hands of the family, but successors apparently did not inherit the same love for nature. With time, the charm of “little paradise” was fading and the island was getting more “earthly” character. 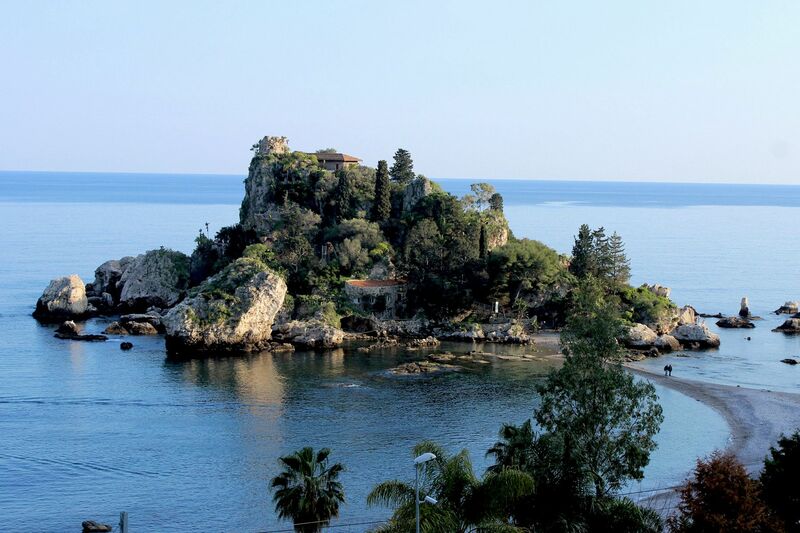 Subsequently, the Isola Bella was sold by Cesare Crosso (nephew of Lady Treveylan and Salvadore Cacciola) to another patrician family from Taormina – Lo Turco (today, their splendid family residence perched on a cliff overlooking the Ionian Sea and the Isola Bella houses a well-recognized Grand Hotel Miramare). In 1930, the Isola Bella once again changed hands but this time for much longer. It was bought by Adriana Bosurgi (owner of Messina’s citrus -derivatives industry “Sanderson”) for her sons Emilio and Leone. This act after years of negligence, brought back the time of glory to the little island. 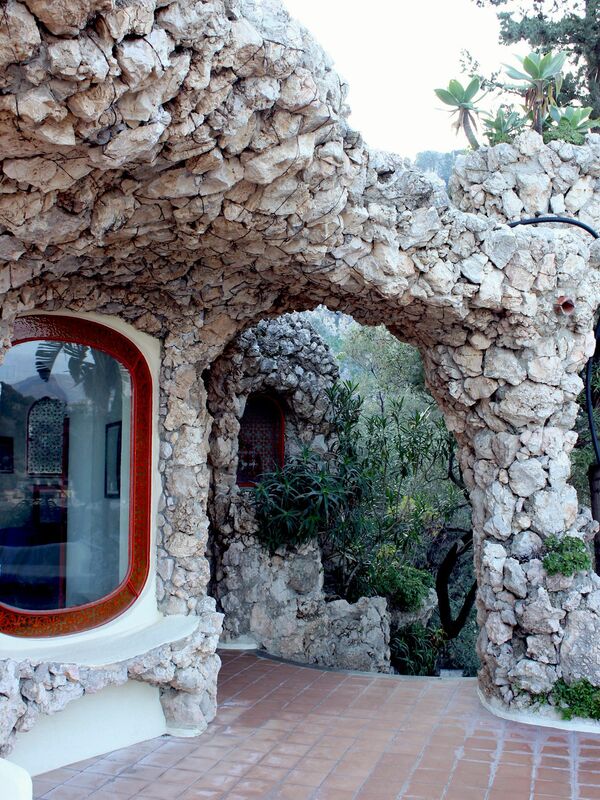 Brothers Bosurgi built there a villa perfectly integrated with the surrounding rugged rocky landscape. 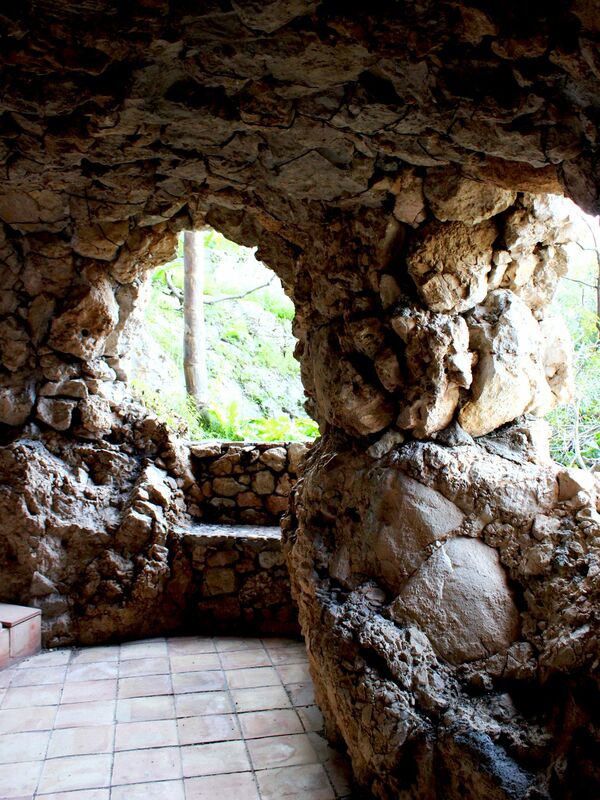 Carefully designed rooms hidden behind stone walls and terraces interconnected by stone-vaulted passages helped to preserve the harmony of the nature (“chapeau” to nature conscious Leo and Emilio Bosurgis). The truth is that the conical-shaped Isola Bella with its area of only about 8,000 square meters by all accounts is very small so any “artificial” structure can very easily disturb the charming work of the Mother Nature. 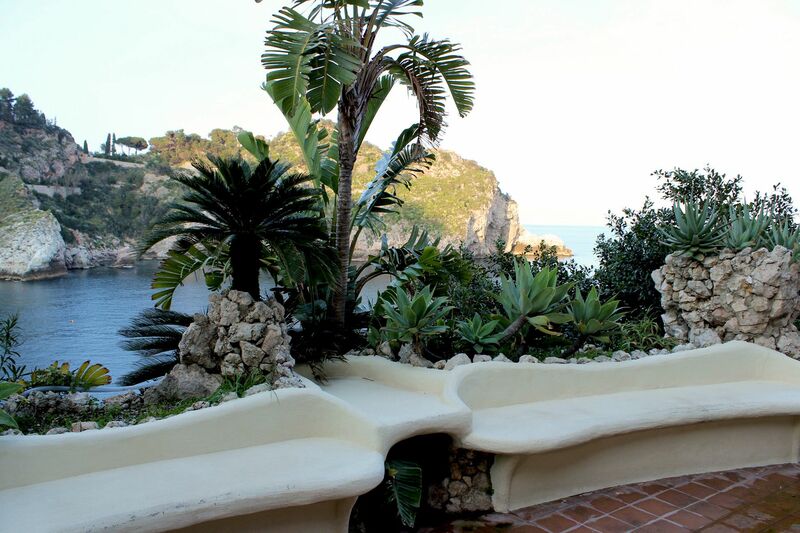 Brothers Bosurgi also expanded already existing garden by adding some magnificent species of flora, bringing this private paradise to the next level of “heavenliness”. It may be hard to see it, but this is the Bosurgi Residence seen from the outside! 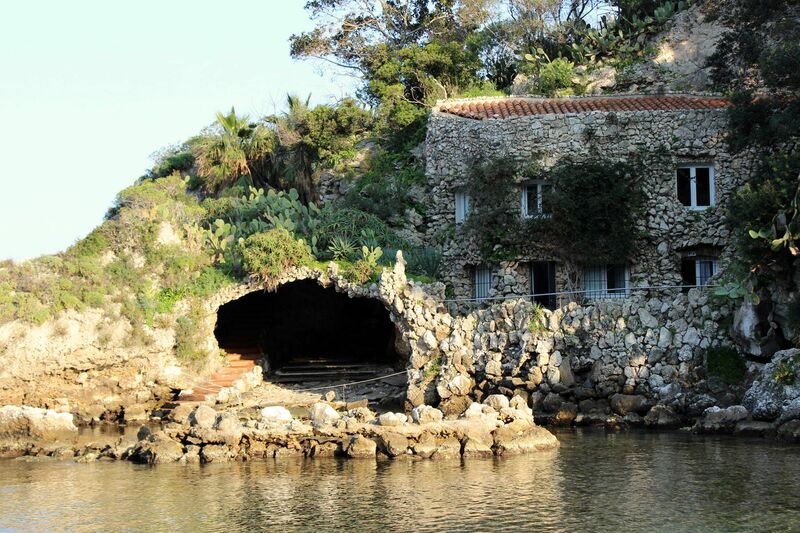 Things drastically changed when in 1991 the Isola Bella got expropriated by the Sicilian Government and was set for sale. But this time, due to the growing public interest in preservation of nature, the Regional Department of Cultural Heritage declared the Isola Bella a “Monument of Nature” and an object of special historical, cultural and artistic value. That basically sealed the destiny of the island. The Isola Bella was purchased by the regional government, then subsequently, in 1998 the Nature Reserve was established on the island. 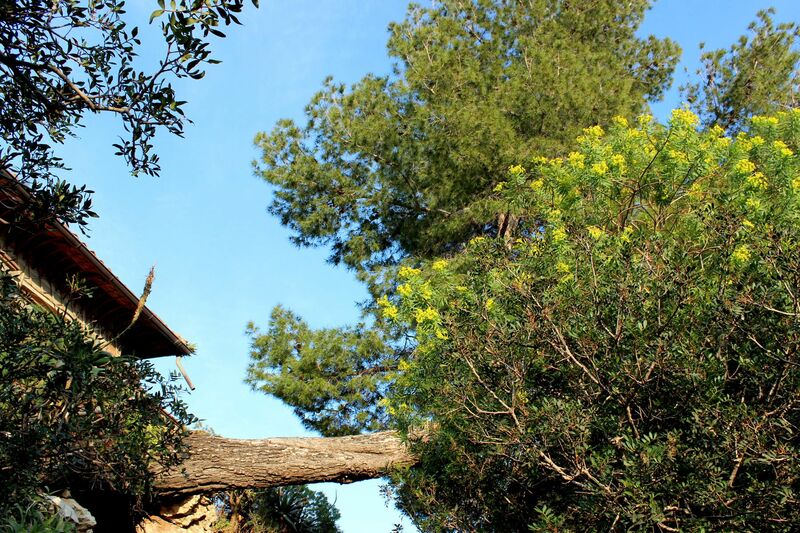 Thanks to these initiatives, today the Isola Bella is accessible to public. 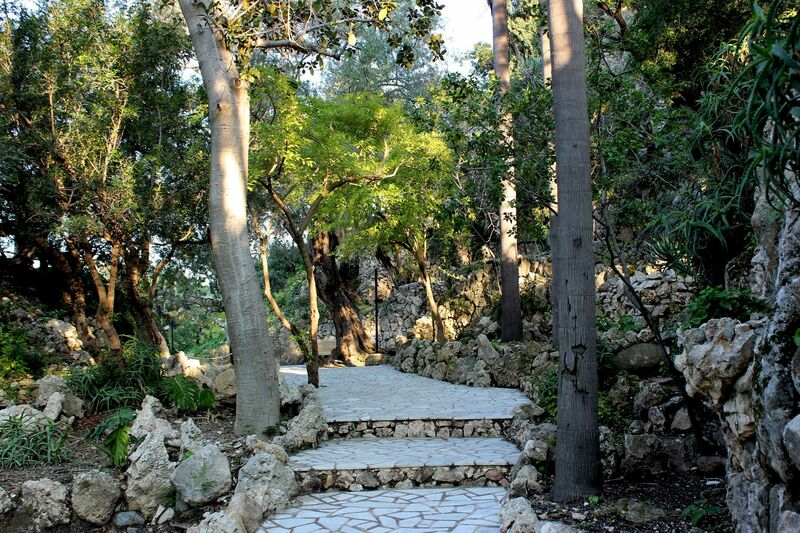 It shares its charm and natural beauty to everybody who can afford symbolic entrance fees (recently € 4 for adult). Former Bosurgi's house - today the museum. Isola Bella is a “package” for visitors. 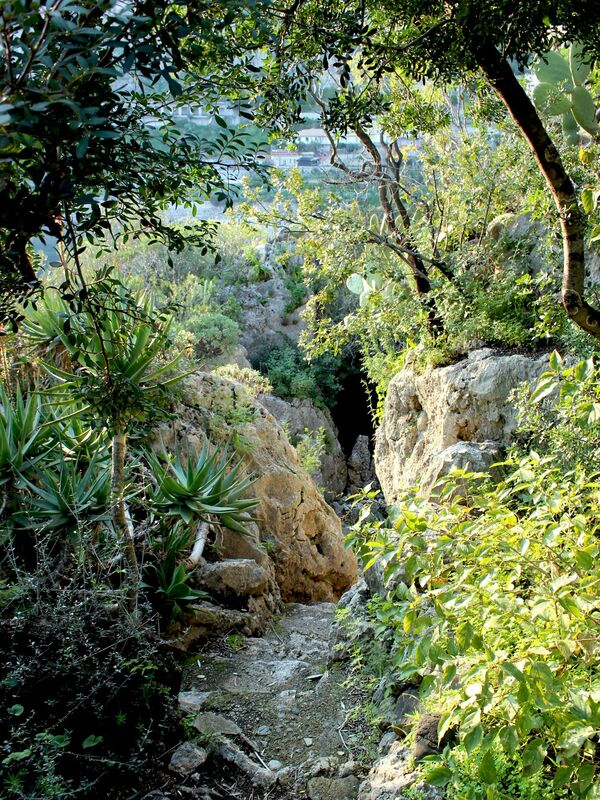 It offers unmatched atmosphere, enhanced by narrow paths winding along the rocky interior overgrown by lush vegetation. Fairy-tale mystery seems to be hanging in the air. While the old Trevelyan’s house encircled by vegetation is still well visible, Bosurgi’s residence is well hidden making part of the rocky landscape. 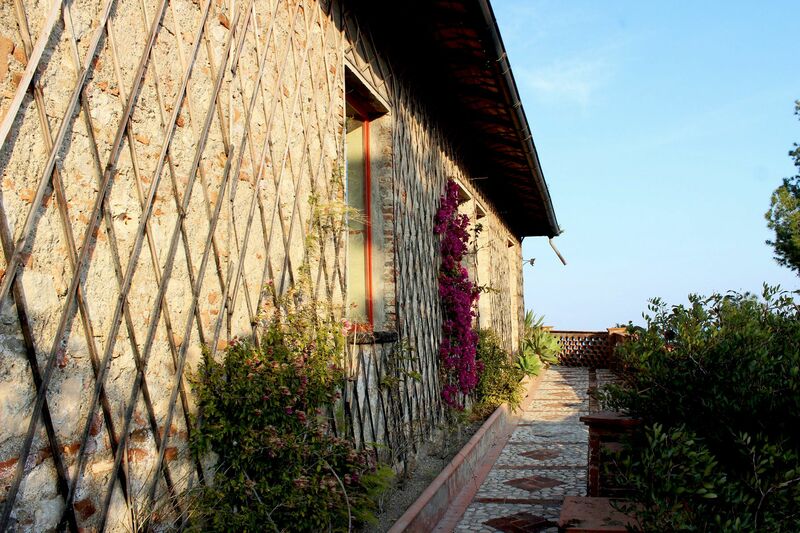 Terraces as well as the little stone tower atop (at some 33 meters above the sea level) offer remarkable views on the bay, promontories of St. Andrea and Capo Taormina, huge rocks partially immersed in the blue waters of the Ionian Sea as well as view on the Monte Tauro and Taormina. Birdwatchers may find here sea birds like Kingfishers, Peregrine Falcons, Cormorants and Grey Herons. Those lucky may spot an endemic and rare red-breasted lizard that apparently lives only on Isola Bella. 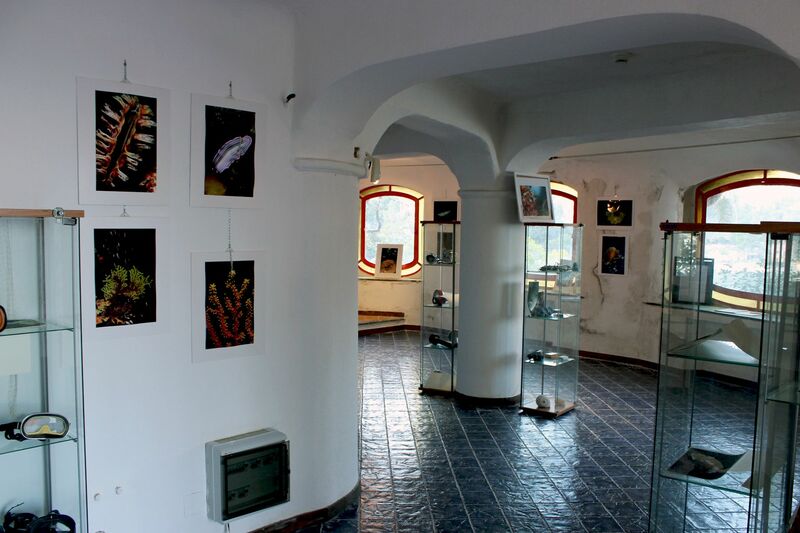 The former residence of Bosurgi today houses a local archeological museum displaying ancient findings from the area. Nearby Giardini Naxos (today a vast open-air archeological museum) is the site of an ancient Greek colony founded in 8th century BC! As the result, the nearby sea is still full of hidden surprises from shipwrecks. For example just next to the Capo Taormina there are remains of a wrecked ship with the cargo of marble columns (some still almost intact despite being some 2,000 years old). 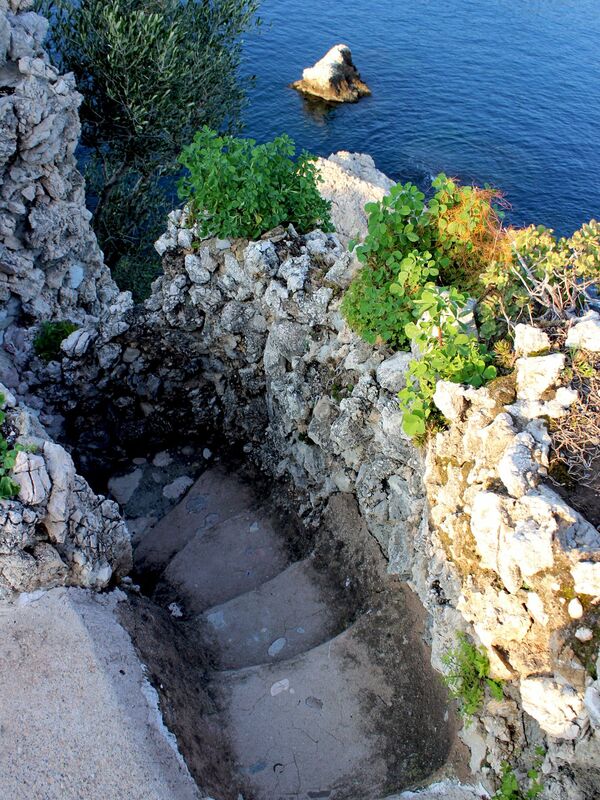 But the coastline holds also remnants and secrets from subsequent centuries. 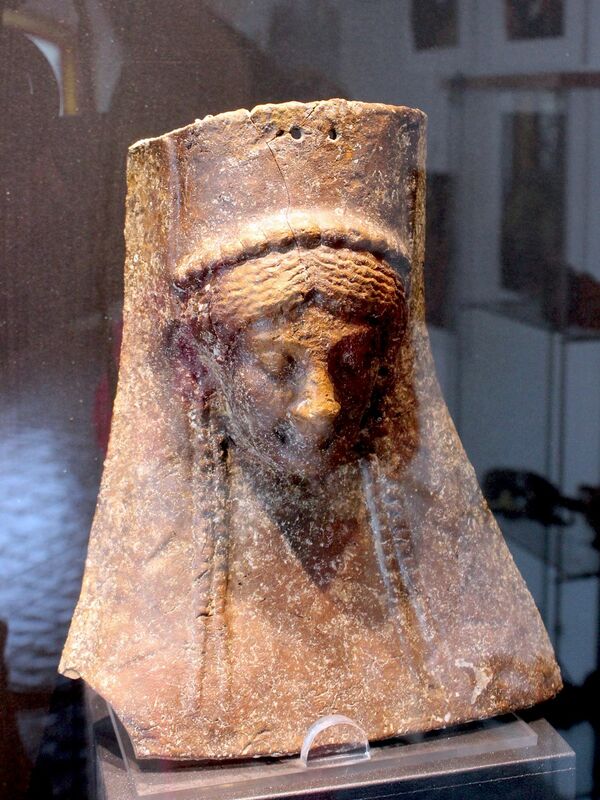 Some – like pieces of late Roman period, Byzantine and Islamic artwork were found on the seabed during archeological survey. It seems that in the ancient past, the bays were used as harbors and shelters for anchoring ships. 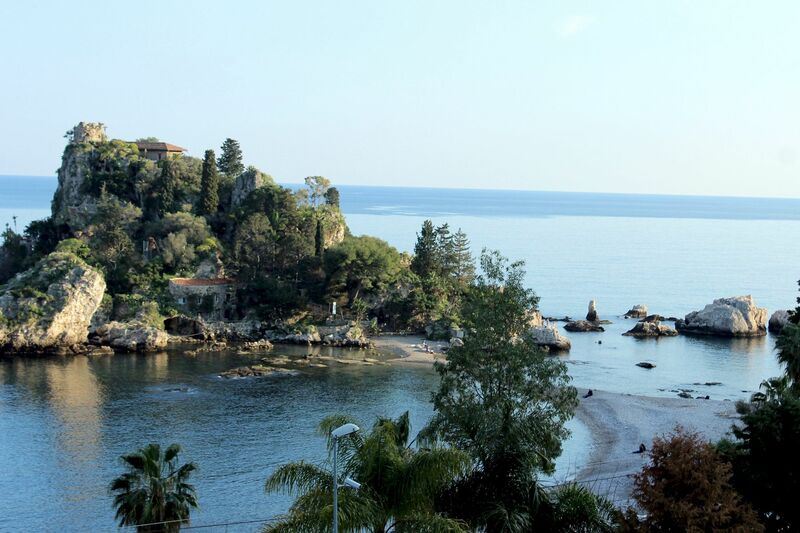 Visitors to Taormina can reach the bay and Isola Bella by taking the Funivia (cable car) from the town (upper station at Via Luigi Pirandello). The Isola Bella’s inlet is located at the walking distance (few hundred meters) from the lower station. 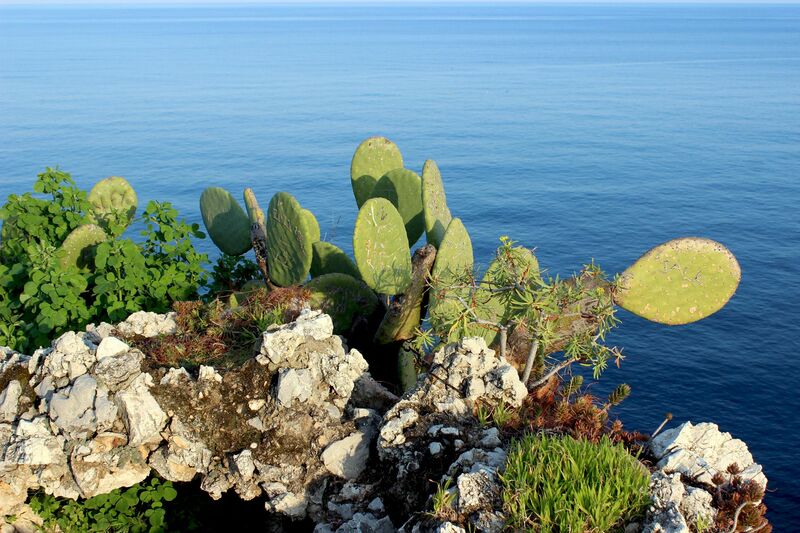 More adventurous and fun will be reaching the island by boating around Capo Sant Andrea . 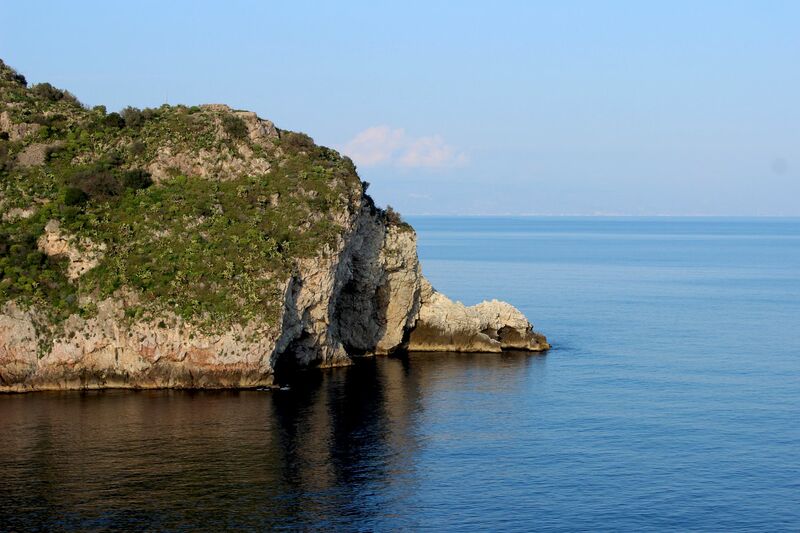 This sea-route offers excellent scenery, colors and few interesting caves on the way (Blue Grotto, Grotto of the Shell…..). In the high season the bay of Isola Bella is really crowded (some even claim that the sea level is higher due to the number of bathers so the connecting path is immersed in water). So if you are not focused on swimming, snorkeling and sunbathing, but rather discovering the fairy-tale paradise, come early morning or late afternoon (the access to Isola Bella is open till one hour before sunset).